Directed by Anna Trent Moore. 2016. USA. 30 min. Bud Browne’s Surfers focuses on some of the most most iconic surfers filmed by Bud Browne from the 1950s through the 1970s. Produced entirely with rare 16mm archival footage from the Bud Browne Film Archives, it is an introspective and heartfelt look into the characters and surfers that shaped their era. Woven with text from Anna Trent Moore’s new book, Going Surfin’, this film captures the timeless essence of surfing through images and words. Following the film will be a talk story with Anna Trent Moore about the people and times reflected in the film, and its relevance to surfing today. Surfers highlighted in the film include greats like Gerry Lopez, John Peck, Ricky Grigg, Donald Takayama, Butch Van Artsdalen, Greg Noll, Peter Cole, George Downing, and Buzzy Trent. 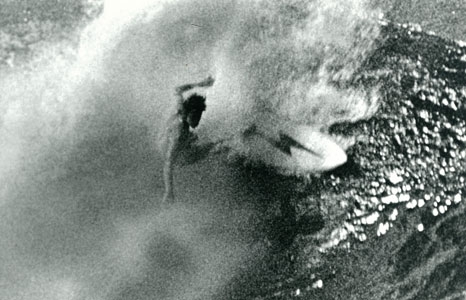 Anna Trent Moore is a teacher, writer, surfer, and curator of the Bud Browne Film Archives. However, first and foremost, she considers herself a Mākaha girl born and raised on the west side of O‘ahu. She is the daughter of one of surf history’s iconic big-wave riders, Buzzy Trent, who pioneered big wave surfing at Mākaha Point. The late Bud Browne, who traveled often to Hawai’i and recorded the birth of big wave surfing in the early 1950s, documented much of her father’s surfing. A close friend of the Trent family, Bud Brown was like a second father to Moore, and upon his death at ninety-six years old, bequeathed his life’s work to her. His body of work encompasses the most in-depth chronological collection of historical documentation of the sport of surfing from the 1950s through the late 1970s and is known as the Bud Browne Film Archives. Today, many surf films needing a historical base have licensed work from the Bud Browne Film Archives collection. Moore has shown Browne’s films throughout the United States, Australia, and Europe and has licensed archival film to numerous film projects. She has written numerous articles on surf history, and is the author of four books: Increments of Fear: The Buzzy Trent Story, One Ocean, Laughing at Water, and Going Surfin’: Profiles of Bud Browne Surfers. Moore divides her time between California and Hawai‘i where she lives next to the Pacific writing about surfing and many things ocean.